Ok, maybe its not quite remodeling. But I had my power tools out and was making some changes to our house while we had some down time in Manatee Hammock. There are several small and trivial things that we have to do on moving day….twice (once when we pack up and once when we unpack). 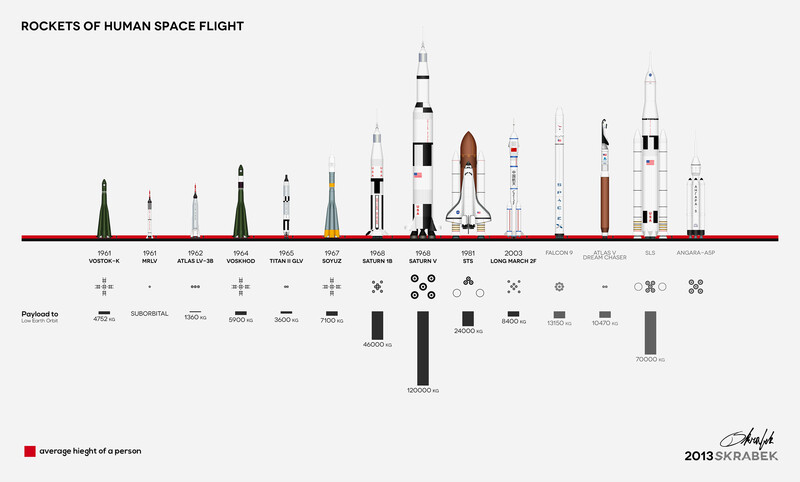 But several small and trivial things add up to a bigger thing. So we tried to see if there were some quick solutions. Quick being the operative word. This trip is too short to spend too much time on home improvement. 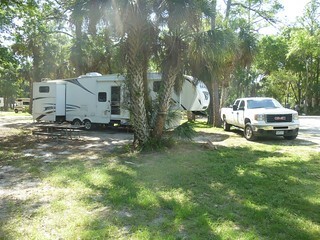 Our 5 days in Manatee Hammock were mostly spent at the campground but we did take one day to go check out Cocoa beach. Our neighbors, Mike and Pat, recommended the Lori Wilson beach and suggested the southernmost parking lot as it had good parking spaces for big trucks. Their directions were spot on and the beach was really nice. 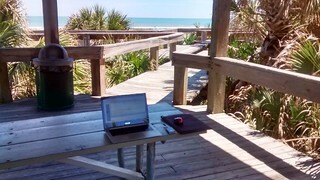 I needed to get some work done and I scored a phenomenal office site in the shade with a table! We were unable to line up a campground in Georgia so we moved back down to Manatee Hammock for several days after leaving St. Augustine. It really does seem like moving day is getting easier. We’ve all got our jobs and the boys especially are getting so they don’t need supervision for theirs. Having a full hookup site helps as I can dump tanks in parallel with other travel preparations going on. When we took the garbage to the dumpster before we left the Pepper Tree “resort” I noticed a whole big pile of couches, chairs and carpet rolls piled by the dumpsters. We had a piece of carpet (free carpet remnant) we used on the vinyl floor at the beginning of the trip to help keep our feet warm in the cold temps. But for more than a month it has just been taking up room in the basement. I inquired if we could leave it with the other stuff and permission was granted….wooohooo, got rid of some stuff! When we first got to Manatee Hammock we had one of the worst spots there. We were in the back corner by some junky schoolbusses and the dumpster. I had a lot of fun at KSC but I was glad when we moved to another much nicer spot surrounded by grass and trees and saw palmetto bushes. It was a little sad when we left but onward and upward as some people say. Little did I know we would be back in five days. When we got back we set up and immediately went to the pool. Let me tell you something. That pool is COLD! The last time we got in I could’ve sworn they’d dumped ice in it because it was colder than the middle of the arctic! Okay, more like the middle of the Pacific. I didn’t love that pool at all. Another thing we liked to do was hang out in our back/side yard and a field that was a walk away. At one point we got a rondo or passing circle with some other people. I should clarify that we were playing soccer. We also had bratwurst a couple nights. The coolest part was easily the spacex Falcon 9 rocketlaunch. 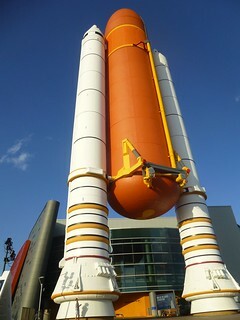 When it first blasted off I couldn’t hear it at all and it just looked like an Estes rocket trailing fire. Then about when it also started trailing smoke I heard the sound. It was a quiet rumble like distant thunder. I felt the vibrations like a far off earthquake. Woah! I’m going all philosophery on myself! Yikes! Yikes yikes yikes! When it got out of view we tried giving lemonade away but only gave away five to other people. This was the first place where we didn’t visit any places or anything. We just got to relax. I guess we did go to Cocoa beach but that was also relaxing I think. We played in superhot sand and bodysurfed in the waves. At one point mom had to drag us out because we were shivering so bad. I liked Manatee Hammock and hanging at the pool and our “yard” and the field. When we left it was sad :’-(. Manatee Hammock is definitely one of my favorite campgrounds we stayed at. Really the only campgrounds I didn’t like were the first place we stayed and that Ross’s place in the keys. Sonora was nice except we didn’t have water, otherwise I liked it. Since the ferry was not running when we were at Matanzas a couple days ago we decided to go back to see the fort…and to get the kids’ Jr Ranger badges. When we left the trailer I noticed water on the ground and I decided to stay back to find the cause and fix it. 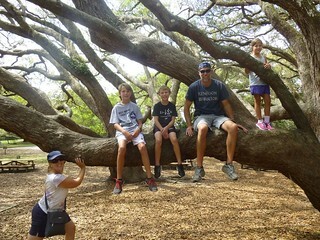 So Steph and the kids went on to the fort without me. They got their ferry ride and were able to visit the fort. On our Florida trip 12 years ago we visited St. Augustine and the Castillo de San Marcos. I remember being really impressed with the castillo and so I was excited to share this with our kids. We had a short drive day from Manatee Hammock up to the Pepper Tree Resort just south of St Augustine. Despite the name, I didn’t really think there was anything that warranted being called a resort other than the price. It wasn’t even an RV park but a mobile home park with a few transient sites. It was a tight turn to get Ava situated on the pad but after a few attempts we got set up. AND we still had time to explore a little bit. 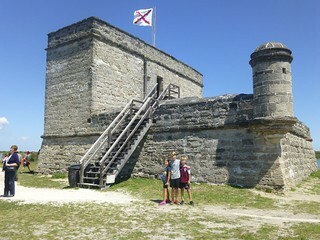 So we headed to Fort Matanzas just a ways south of where we were staying. We learned about hardwood hammocks back in the Everglades and we were now staying at the Manatee Hammock campground in Titusville FL.